Found mostly west of the Mississippi River, these burrowing animals range from 6 to 12 inches long and sometimes are confused with ground squirrels. However, these furry creatures with strong digging claws and sharp teeth can cause lots more damage to lawns and gardens than a squirrel. They feed happily on above- and below-ground portions of many plants. Roots crops such as potatoes and carrots, and bulbs such as tulips, are favorite targets. 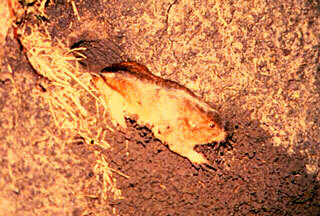 Gophers may gnaw bark from young trees in winter, and even chew plastic water lines when water is scarce. Their tunneling also leaves mounds of soil pushed to one side and plugged shut (versus mole mounds that are round and open). Their burrowing is deeper and not as obvious as mole tunnels. It's important to act quickly once you see signs of gopher activity, because once a tunnel system is in place, other gophers will quickly replace any you drive away. Various methods can help to repel gophers, but very few are foolproof. Some plants such as gopher spurge (Euphorbia lathyrus) and castor bean (Ricinus communis) have been reported to deter gophers because they exude a poisonous substance from their roots. Research shows that neither of these are consistently effective repellents. Putting substances in gopher tunnels -- used kitty litter, rags soaked in predator urine or pine oil -- works for some gardeners. Ultrasonic noisemakers provide only short-term relief. The most effective controls are exclusion and trapping. In small beds, gardeners can create cages or baskets to protect prized plants. Dig a 2- to 3-foot-deep hole in the planting area and line the sides and bottom of the hole with wire mesh. Replace the soil and plant your garden. Protect trees with wire mesh guards placed a few inches below the soil line and 2 feet up the trunk. If need be, use traps to kill problem gophers.